The message...over the next six weeks, Make it Harborough, for the best entertainment possible! Council leader Blake Pain. '(Picture: Andrew Carpenter). If you’re looking for some fun and excitement in the coming weeks...Make It Harborough. That’s the message of a new Mail campaign launched today (Thursday) to highlight the amazing line-up of entertainment taking place in the town and surrounding area from this weekend until the middle of September. The first event set to delight the crowds is this Sunday’s Market Harborough Summer Fayre at the town’s rugby club. The campaign will then highlight the town’s first ever Food and Drink Festival the following weekend, the truck-pull event on Sunday, August 30, the Great Glen wheelbarrow races on September 5, the huge Arts Fresco street arts festival in Market Harborough on September 6, and the always popular Lubenham Scarecrow Festival weekend on September 12-13. 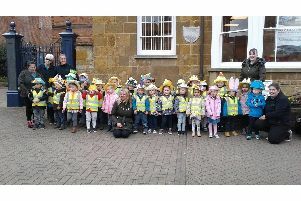 Harborough Council leader Blake Pain is backing the campaign and said this week: “We should be very proud that we get to host such exciting cultural events in our district. It’s very special. In my view, we should be extremely proud of the diversity and number of events that independent organisers promote within the district. The Summer Fayre this Sunday is taking place at Market Harborough Rugby Club in Northampton Road, between 11am-7pm. Admission costs £3 and the list of attractions includes music from The Voice finalist Sally Barker and an appearance from Harborough’s Great British Bake Off champion Frances Quinn who will be signing copies of her debut book and judging the Fayre’s very own “Bake Off” contest. Other big pulls include a Red Arrows flypast, classic cars and a feast of food, from Caribbean cookery and paella to a hog roast and pizza. Among the live music line-up will be The Ann Duggan Band, The Riff Raff Element and Harborough Band. There will be more than 40 stalls. More details at www.summerfayre.com . Market Harborough Food and Drink Festival - Sunday August 30 to Monday, August 31. This free August Bank Holiday special, with more than 100 stalls, takes place in Welland Park, from 11am to 7pm. Local, regional, national and international cuisine on offer includes artisan breads and cakes, cider and beer brewed in the region, local meat, pies, chutney and cheese. Street food traders will offer an array of European, Asian, Indian, African and Caribbean foods. Sweet treats range from from indulgent chocolate, to pancakes, waffles and handmade fudge. Alongside the food stalls, there will be a licensed drinks area, live music, craft stalls, cooking demos, street entertainers and face painters. Truck Pull Challenge UK - Sunday August 30. Another free event. Guinness World Records experts will be on hand later this month, when the Truck Pull Challenge UK comes to Market Harborough. Event organiser Gary Gardner said he is confident that a world record will be broken at the town event, where teams of 15 pull heavy trucks a mile from the edge of town by The Point business park to the finishing line by The Square in the town centre. The Truck Pull is part of a big family fun day, which includes an afternoon and evening of entertainment on a town centre stage, led by X Factor runner-up from 2013, Nicholas McDonald. “I know that Harborough will be holding the truck pull world record after that day” organiser Mr Gardner told the Mail. The truck pull runs from 9.30am to 4.30pm; the music from 4.30pm until 9pm. High noon at the Recreational Ground at Bindley’s Lane, Great Glen, sees the start of the summer fete, with lots of stalls and an Irish music and dancing display. The races themselves are at 2.15pm (junior race) and 3.15pm (adult race). It’s free to watch. Arts Fresco - Sunday, September 6. Billed as the biggest street theatre festival in the Midlands, this free event features more than 50 street performers. It takes place in a Market Harborough town centre closed to traffic, between 11am and 4pm. Scarecrow Festival - Saturday, September 12 and Sunday, September 13. Dozens of scarecrows dotted round the village, plus 80 stalls, a fun fair, live music, steam engines, vintage and classic cars and tractor rides. The village fun lasts from 11am until 6pm. And don’t forget The Wistow Maze, Foxton Locks, Stanford Hall (open Monday, August 31), Harborough museum and Lutterworth Museum.